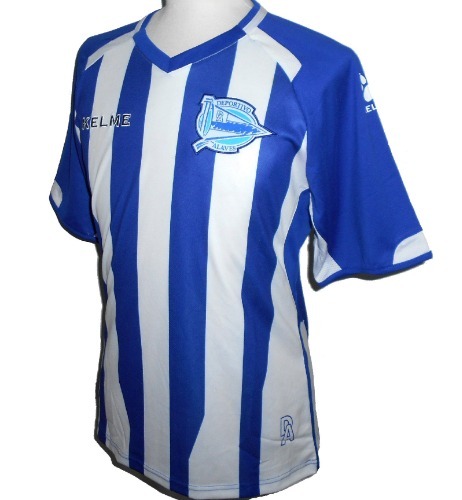 This is the 2018/19 season home football shirt of Spanish club, Deportivo Alaves. This is an official shirt made by Spanish company, Kelme, and is new with tags in Kelme packaging. We are an official Kelme stockist. - Kelme logos on chest and shoulders. - DA on lower front of shirt. - Blue and white stripes. - Basque badge at the back of the neck. - New with tags in Kelme packaging. - Kelme authenticity hologram on lower front. - See our own stock photos of the actual shirt (size M shown in photos). - Adult Mens size EU-Medium. Chest 40", length 26". Equivalent to a UK/US Medium size.